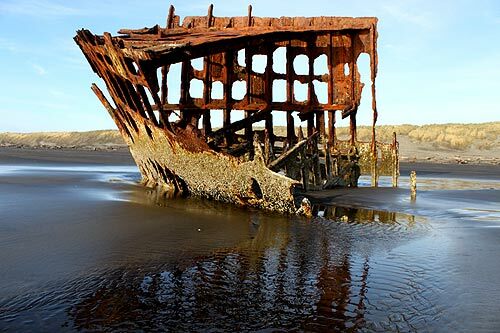 What Are the 7 Wonders of the Oregon Coast? (Oregon Coast) – Much has been made lately of the Seven Wonders of Oregon in the travel and tourism world – and with good reason. The rest of the planet is just discovering the eye-popping features of Crater Lake, the Gorge and the Cascade Mountains, along with the bucolic, fairy tale-like greens of wine country. (Above: Oceanside). 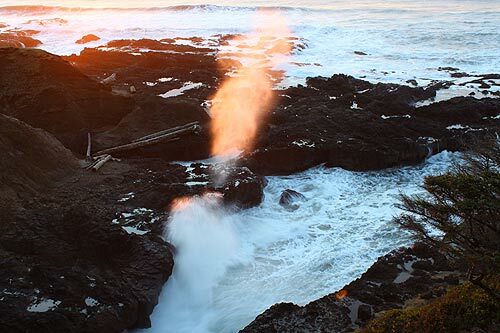 But did you know there are seven wonders of the Oregon coast itself? Even in just the upper, northern half of these beaches, wowing features abound that rival all the other six wonders of the state. Astoria and Warrenton. Stunning history is constantly on display here, with the Victorian homes that dot the mesmerizing town of Astoria (where tons of movies were made, include Goonies), to a major Civil War and WW2 battlement. A host of big ships and engaging architecture add to the atmosphere of Astoria, while just south of there you'll find the hollowed out concrete near-ruins of Battery Russell and one of the world's most photographed shipwrecks. Numerous Lewis & Clark landmarks are as well. Seaside to Cannon Beach. Both towns are big on family attractions and fabulously clean beaches, while Seaside caters more to kids and Cannon Beach tips towards the upscale. 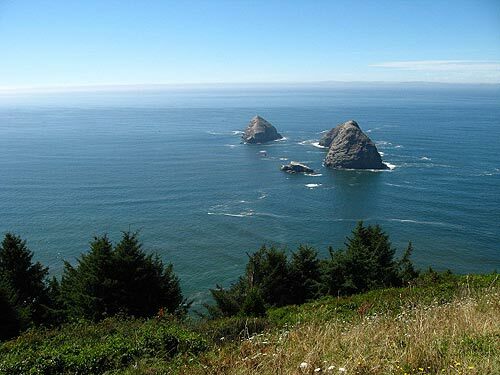 A secretive lighthouse beckons just offshore and between the two sits soaring Tillamook Head and its hiking trails. Southern Cannon Beach and just beyond that has a host of hidden beaches full of surprises - including remnants of an ancient road - while Seaside's most northern tip contains more sand dollars than you've ever imagined. Manzanita to Rockaway Beach. 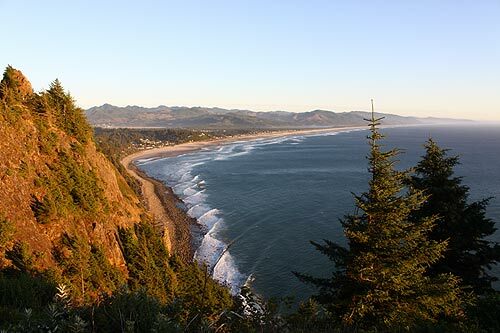 One of the most amazing viewpoints on all the Oregon coast lurks above Manzanita, while both towns host miles and miles of pristine sands. 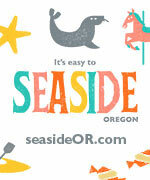 Between them is the Nehalem Bay and its varied recreational pleasures, including kayaking. Manzanita has a sleepy vibe but sophisticated side, while Rockaway Beach is a bit of a resort town for the whole family. Three Capes Loop. 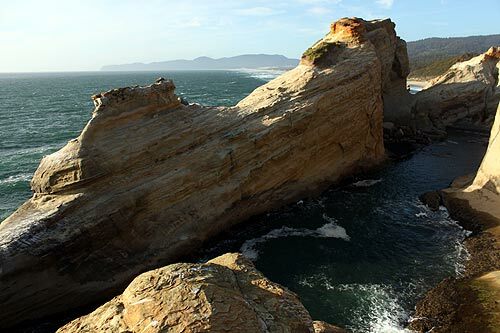 25 miles of non-stop amazement sits tucked away, with the little villages of Pacific City, Oceanside and Netarts hosting three jaw-dropping headlands. A lighthouse, a mysterious tree anomaly, a cave tunnel, bay crabbing, a canyon made of ocean, and soaring clifftop drives that drop onto sandy and rocky beach wonders are just the beginning here. You could easily spend a week exploring and not find everything. Lincoln City to Depoe Bay. 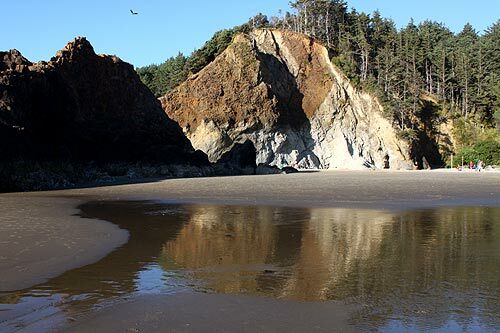 Seven miles of soft sands at Lincoln City are briefly interrupted by Siletz Bay, then resuming in the form of intriguing hidden pocket beaches around Gleneden Beach. 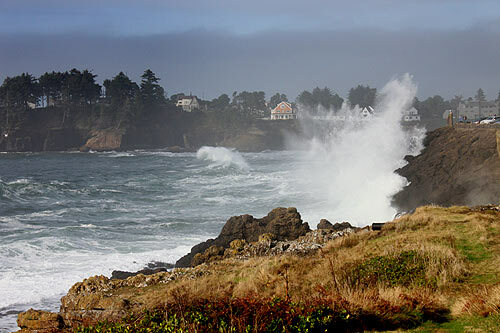 A few miles of that and you're in Depoe Bay, with soaring, rocky viewpoints, cloistered coves, whale watching in abundance, wild waves and a few hidden scenic roadways to explore. Newport and Waldport. Between the two you've got nearly 20 miles of sand, sometimes broken up by wonders like Yaquina Head and its towering lighthouse or the crabbing meccas of Alsea Bay and Yaquina Bay. A bustling waterfront gives way to quiet, history-laden Nye Beach in Newport, while nature spots like Ona Beach, Moolack Beach or Seal Rock provide a constant stream of beachy or intertidal wonders. Yachats and Southward. 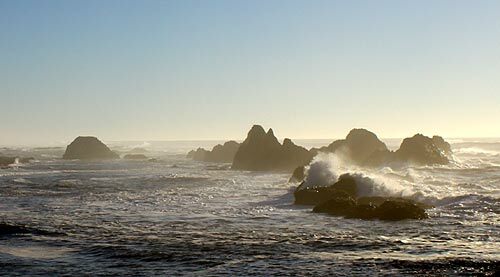 Another stunning stretch of about 25 miles begins with the rocky blobs and jagged shoreline of Yachats, where crashing, rollicking waves are perpetual and dazzling. From there, you encounter viewpoints sometimes hundreds of feet above the world, places of gravity-defying, mighty ocean explosions like Devil's Churn or Cook's Chasm, and a bevvy of really unpopulated, intricate beaches. Some are stretches of sand or basalt, while most are a fascinating blend of the two that are full of nooks and crannies to discover. See the virtual tour links above for even more information on all these areas, or at the right. You'll find lots of information most coastal guides don't give you, including other hidden caves, viewoints, wild geologic features, closeups of distant landmarks you can't get to, as well as extensive map and directions to find them.